It is with great pleasure that the Baylor University Women's Council of Dallas names Gloriana Simmons Parchman as Woman of Distinction of 2001-2002. As permanent secretary for the class of 1954, Gloriana has hosted numerous class reunions at Homecoming. An able organizer, Baylor has tapped Gloriana many times for special volunteer jobs including coordinate Spring Fling, the Baylor women's spring event held on campus since 1983. 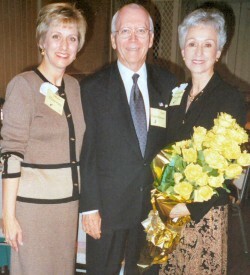 She also chaired the reunion event at the 2004 Dallas Diadeloso. Active in the Baylor University Women's Council of Dallas since its beginning in 1987, Gloriana served as the organizations second president (1988-1989), helping formulate the purpose and bylaws of the organization. Gloriana began her year with a fall luncheon at The Grand Kempinski--now the Hotel Intercontinental--and in April presided at a New Orleans-style brunch at the Doubletree Hotel at Lincoln Centre. Under Gloriana's leadership, the Council established the BUWC Endowment Fund to support the scholarship program. During her presidency, the Council presented scholarships to two Baylor coeds, provided funds for the Ferrell Center matching grant campaign, and supported the Southwest Conference Women's Basketball Tournament fund to provide tickets to deserving children. Gloriana is a member of First Baptist Church, Richardson, and she has often said that her mission in life is serving Christ through others. While at Baylor, Gloriana sang with the Baylor Religious Hour Choir and was active with the Baptist Student Union. She is a life member of the Baylor Alumni Association and past BAA board member, as well as being a charter member of the Old Main Society. Gloriana and her husband, Leo, have been generous donors to Baylor, giving the Leo & Gloriana Parchman Business Scholarship, Athletic Scholarship, and funding a lecture series. They are contributors to the Alumni Center expansion, the President's Club, Bear Foundation, the class of 1954 scholarship fund, Floyd Casey Stadium renovation, the Herbert and Joy Reynolds Endowment Excellence Fund, and Truett Seminary. They are both the 1997 recipient of the James Huckins medallion representing over $250,000 in cumulative giving to the University. Gloriana and Leo's family includes two married children---Drs. Mike and Julia Parchman of San Antonio, and David and Sheri Parchman Starnes of Lindale, Texas---and two grandchildren, Kyle Starnes, who is attending Baylor, and his younger brother, Jacob Starnes.